These yummy muffins are very easy to make, are packed with protein and can be stored in the fridge and reheated in the microwave later on. METHOD: Preheat your oven to 200 degrees and, while you wait, lightly grease a 12-hole muffin tray with butter. 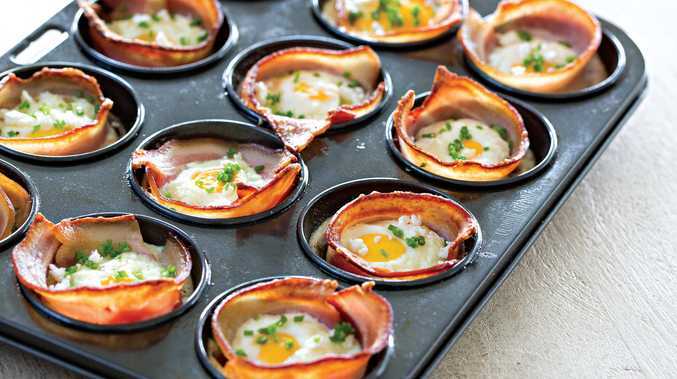 Cut the rashers in half, and line the sides and bottom of each muffin cup. Next, crack an egg into each one. Sprinkle the tops with some feta cheese (if using) and chives. Season with salt and pepper to taste. Bake for roughly 15-20 minutes, or until the egg whites are set. Remove and allow to cool slightly before serving. Makes 12.